These Pet Rescue level 648 cheats and tips will help you beat level 648 of Pet Rescue. 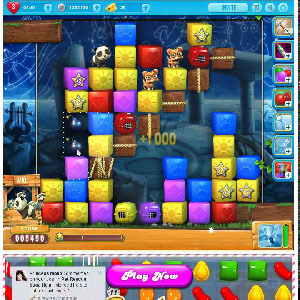 The objective of Pet Rescue level 648 is to rescue 10 pets and reach 3,000 points. To start Pet Rescue Saga level 648, the pets will be in crates. You will need to break open their crates as soon as possible to start collecting them. Look for combinations with the blocks that are next to the crates. The board has blocks in a staircase format going down the center of the board. Make sure you understand how the blocks are falling. There will be fire and ice bomb blocks that drop on to the board. Combine the fire blocks with the ice blocks in order to create a regular bomb. The bombs are a great resource to help you break open the pet crates. They can also be used to clear out the blocks that are stopping the pets from being collected at the bottom of the board. In this level you will be give the paint bucket booster. Once the paint bucket booster is full, look to activate it. Paint the blocks that will help you to bring down the pets more effectively. You may only get one chance to use the booster, so use it wisely!